Name a famous concert pianist who plays only classical music. Don’t use Google. Did any names spring immediately to mind? Don’t worry if they didn’t. In this day and age, very few classical musicians become household names. 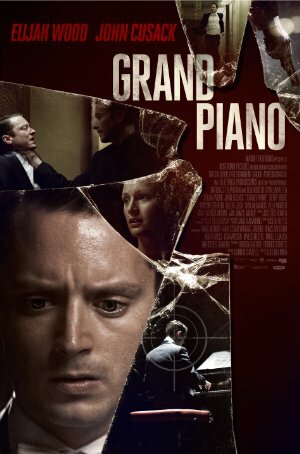 But within the world of classical music, they are very well known and the surprisingly good thriller Grand Piano focuses on just this sort of musician. “Tom Selznick” (Wood) is a brilliant ‘young’ pianist who was on his way to the very pinnacle of his field when he broke down in the middle of a performance. A performance where he might have been attempting something beyond his grasp. Now, five years later, he is returning to the concert hall to perform again. Hoping he has conquered the stage fright that has consumed him since his last performance. The famed actress “Emma Selznick” (Bishe) he is married to is in the audience, along with one of her close friends, “Ashley” (Egerton) and her husband. Ashley is unhappy that she isn’t able to sit with her friend, and has little interest in the concert that is about to unfold before her. Backstage just before the performance, Tom is examining his sheet music and he finds a piece that he wasn’t planning to perform. It is La Cinquette, the magnum opus of his deceased mentor. It is the piece Tom was playing when he had his melt-down, and is considered by many to be unplayable. Also important is that with permission of the mentor’s estate, his personally designed piano has been flown in to the concert hall in Chicago. Tom discards the music and heads to the stage. “Reisinger” (McManus) is the conductor of the orchestra that is backing Tom’s concert and he is both old friend and pain in the posterior to Tom. Everything is going well until Tom spies the note on the piano. If that wasn’t enough to convince him, the bright red laser dot that shines on him makes him aware there is a sniper out there who can and will shoot him. Or worse yet, kill Emma right in front of him. Some will dismiss this as nothing more than Phone Booth on a concert stage, or Under Siege on a piano stool; but that’s a mistake. Director Eugenio Mira allowed himself to be influenced by the right masters of the thriller to make this film work. Echoes of De Palma and Carpenter are there, more so than those of Alfred Hitchcock, who Mira admits is a major influence on him. Elijah Wood is perfectly cast as the tortured artist who looks wide-eyed but is very jaded by his experiences. He and Kerry Bishe have the right chemistry to evoke the specter of a couple very much in love with one another; and desparate to ensure each fulfills their dreams. Don McManus is wonderful in the small role as leader of the orchestra while Alex Winter is fun to watch as the sniper’s behind-the-scenes assistant. The assassin himself, John Cusack is mostly heard and not seen, and this is another facet of this film that works quite well. You don’t have to love classical music to enjoy the playing of the Grand Piano. Plot: A pianist with stage fright endures a performance under enemy eyes, who will shoot if a wrong note is played. ‘Unstoppable’ director Tony Scott commits suicide in L.A.